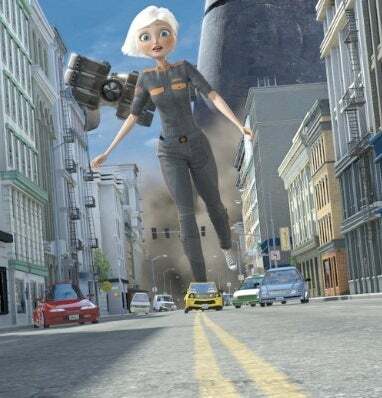 Monsters vs. Aliens, which opens today, is DreamWorks' first film designed to be shown in 3-D, but despite a female protagonist and fantastic cast of funny men, critics say it's two-dimensional. Directed by Rob Letterman and Conrad Vernon, the film tells the story of Susan (Reese Witherspoon), a Californian bride who gets hit in the head by a meteor on the day she's supposed to marry her self-important fiance, Derek (Paul Rudd). Susan grows 50 feet tall and the military takes her to a detention center for monsters. While there she meets B.O.B. (Seth Rogen), a gelatinous blue blob; Dr. Cockroach (Hugh Laurie), who is half-insect, half-mad scientist; and Missing Link (Will Arnett), the part fish, part human. When the evil alien Galaxhar (Rainn Wilson) threatens Earth, General W.R. Monger (Kiefer Sutherland) convinces the President (Stephen Colbert) that the monsters should be released, as they are the only ones who can save the planet from cartoon doom. From now on, DreamWorks Animation says it is only going to movies designed for 3-D. Monsters vs. Aliens is supposed to prove that the format can work as a story telling device rather than just a gimmick during Super Bowl commercials. With its stereotypical themes of outcasts saving the day and a bit of girl empowerment, it's not clear that they succeeded. While the critics found the jokes moderately amusing and most of the voice acting solid, when the film is viewed in 2-D, without anything being hurled at the screen, the story unoriginal. Below, we size up what the critics are saying about Monsters vs. Aliens. The dialogue has its share of the sly grown-up/cultural references that have become de rigueur for DreamWorks projects, designed to make sure the adults in the audience don't fidget, but there aren't enough of them to push this into full-fledged comedy mode. Which means it's up to the action/thriller elements to power the film, and they are never quite bold enough. So it comes down to the story and the voice actors to carry the day, and they have their moments — particularly the monster crew led by a feisty Witherspoon, who brings some of the edgy-fun of her Election mean-girl to Susan as she grows stronger. The best running gag comes when BOB falls in love with a Jell-O mold. The mold has more shape and structure than anything else about the movie. Rogen gives a textbook demonstration of the unlikely power a juicy voice performance can provide to a gelatinous mass. Yet, amazingly, in a cast that also includes Stephen Colbert as a reputation-conscious president and Kiefer Sutherland as a monster-wrangling general (with the joke name W.R. Monger), no one else stands out or steps up the way Rogen does. The bright, enthusiastic performances from Rogen, Witherspoon, Laurie, et al., put Monsters vs. Aliens over, not the dialogue that trundles along a well-worn family movie rut. Rudd displays none of his sneaky charm as the fiance - turns out you need to see this actor to get the joke - and the same goes for Stephen Colbert as the US president, who's drawn much funnier than he sounds, like a Mort Drucker caricature in a vintage '60s Mad magazine. In general, though, the animation isn't terribly impressive if you take away the 3-D; the monsters are fetchingly bizarre, but all the women look like Bratz dolls. Monsters vs. Aliens, one of the 2009 big movies designed to highlight where 3D could transport audiences, is an example of technology run amok. With a slight, light screenplay that required five credited writers, the film tells an unimaginative story about an alien invasion of Earth that is foiled by "monsters." Of course, they're not really monsters. They're just misunderstood. But since they're in the 3D, we're too busy watching whizzing comet fragments fly out of the screen to care about things like plot or character development. It's a good thing, too, because anyone on the lookout for those elements may be a little disappointed. Here, directors Rob Letterman and Conrad Vernon push so hard for three-dimensionality - and they're so reliant on it - that they basically have their animators putting sightlines before storylines; they set up practically every scene so that something in it can be sent careening at your head. After a while, you can see the setups happening - and once you do, the careening gets predictable. Which gets old, really fast. On some level, the latest DreamWorks CGI project isn't a movie so much as a gag-delivery system wrapped in special effects. The story is crammed with incident, yet completely trifling; there are a ton of personalities, but no real characters. It zips along at hyperspeed, alternating jokes, explosions, and videogame-ready action segments, but never comes to rest long enough to make an impression. It's available in some markets in 3D, but regardless of presentation, it's strictly two-dimensional.